SPRINGDALE – The seven Keyhole Canyon canyoneers who were overtaken by a flash flood in Zion National Park Monday night have been identified by authorities. The seven people who died in the flood have been identified as: Mark MacKenzie, 56, of Valencia, California; Linda Arthur, 57, of Camarillo, California; Steve Arthur, 58, of Camarillo; Gary Favela, 51, of Rancho Cucamonga, California; Don Teichner, 55, of Mesquite, Nevada; Muku Reynolds, 59, of Chino, California; and Robin Brum, 53, of Camarillo. 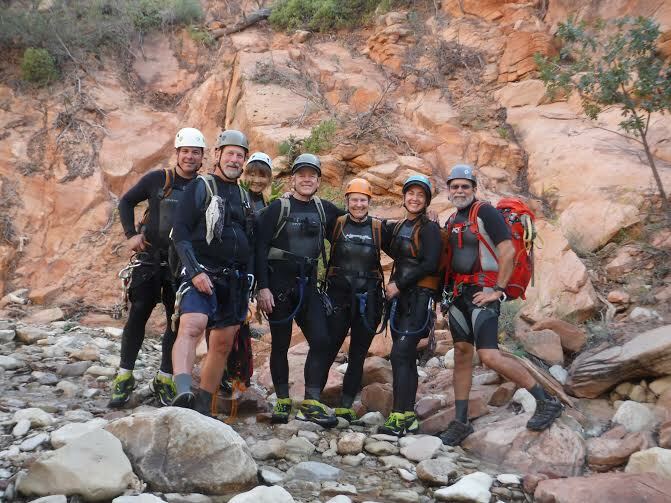 The families of the canyoneers extend their deepest gratitude for all of the search and rescuers, according to a press release from Zion National Park. The family members have also requested privacy during this difficult time. During the search and rescue operations, more than 60 searchers from multiple agencies contributed over 1,135 hours in their efforts to find the missing people, the press release said. Agencies assisting Zion National Park included Washington County Search and Rescue, Kane County Search and Rescue, Sanpete County Search and Rescue, Washington County Sheriff’s Office, the Town of Springdale, Rockville-Springdale Fire Protection District, Rocky Mountain Rescue Dogs Unit, the Color Country Interagency Fire Center, Bryce Canyon National Park, Cedar Breaks National Monument, Glen Canyon National Recreation Area, Grand Canyon National Park and Grand Canyon-Parashant National Monument. “We appreciate all of the support from our cooperators and staff for all of their care and assistance,” Bradybaugh said. Search and rescue efforts concluded as of 6 p.m. Thursday, according to the press release, but an investigation is still ongoing.